Whether you’re a frequent globetrotter or are looking forward to your yearly family getaway, there’s nothing like the excitement of traveling to a new (or beloved) location. But if you’ve got a furry friend at home, the separation anxiety of traveling without them can put a damper on your anticipation. Commercial airlines have strict pet policies that force you to choose between potential discomfort or danger to your pet by placing them in the cargo hold, or leaving them behind. Although deaths on commercial planes are somewhat rare — only 26 animals died on airplanes in 2016 (out of the 10,000 animals that were transported) — there’s little more nerve-wracking than fearing for your pet’s safety when they’re traveling in the cargo hold. When you fly on a private plane, your dog, cat, or other animal gets to enjoy the luxury and comfort of the main cabin right alongside you. Your pet can stay in their crate, or can roam free in the aisles (if they’re plane broken). But beyond these requirements, your pet enjoys the freedom and comfort of flying in the cabin alongside their favorite person — you! 1. Take them for a car ride first. If you’re pet has never traveled before, its important to take them on a trip in the car first. This will help you predict how your pet will fare on their private flight. If they get motion sickness in the car, you may want to bring a medication to help settle their stomach when they fly. Speak to your vet about your animal’s medication options. Plus, if your animal seems restless or nervous in the car, they may prefer to be kept in their crate when flying. On the other hand, if they seem more at ease outside of their crate, a test car ride will help you understand their travel preferences before their first flight. Even though your pet won’t leave your sight on a private flight, it’s still a good idea to include your contact information on their tag. In rare instances where your pet gets away from you right before or after you board, it’s important for your pet to have identification. If you’re bringing a crate, add your phone number and address to it as well. That way, a person can reach you quickly should your animal wander. If your pet isn’t already chipped, chipping your dog or cat is another way to find them if they get away from you at any time during travel. Unless your pet is trained to use a toilet (which would be an amazing feat), your animal’s bathroom options are limited once on board. 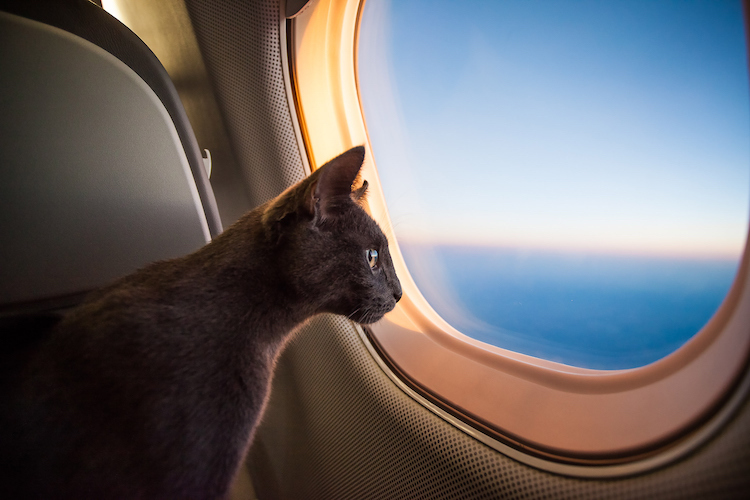 For cats, you’re welcome to bring a litter box onboard for longer flights. If your dog needs to do his or her business while in-flight, lay down layers of newspaper in their crate. Try not to give your canine companion too much food or water before they get on fight to make it easier to hold it while in the air. A private jet speed may be the same as or slightly slower than a commercial airline, but the total travel time is significantly less. You dog won’t be sitting in line at security or baggage claim, so they’ll only need to hold it for 1-4 hours (depending on the length of the flight). That’s much shorter than a work day when they sit at home, and shorter than a day traveling on a commercial flight. If you have other concerns about how well your pet will travel, talk to your veterinarian. If your animal is notoriously nervous when they travel, your vet can recommend behavioral and medical solutions. Following these steps will prepare your pet to enjoy the trip every bit as much as you.